All the power of Coconut oil and Biotin in a #Bombar version for your hair. All the power of Coconut oil and Biotin in a #Bombar version for your hair. The Inoar #BombarCoconut line has arrived. The version of the original enriched with coconut oil and a kit in the measure to clean and moisturize with active that collaborate for the growth and the health of the wires: shampoo, conditioner. The line has no sulfates, petrolatums, is released for low-poo/in the poo. 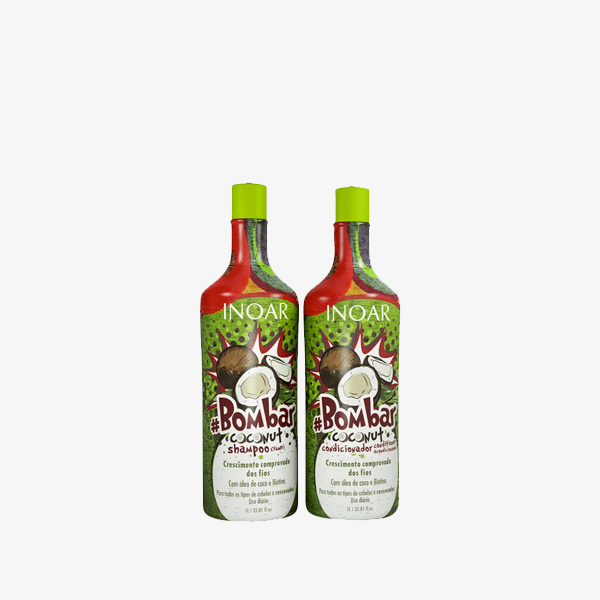 Inoar Bombar Coconut Kit Duo is an ideal treatment for those who want to make their hair grow in a natural way, even with greater nutrition and hair protection. Bombar Coconut contains Biotin, known as the beauty vitamin, which helps with hair growth, strengthening and combats hair loss, and more coconut oil, rich in Vitamin E and fatty acids, a powerful moisturizer that acts on the inner portion of the hair, re-building and strengthening it. Regular use encourages hair growth and keeps hair healthy. The Inoar Bombar Coconut Kit Duo delivers an impressive result since the first application of the products. With the addition of coconut oil in its composition, the product also stimulates hair growth in a natural way. All types of hair, especially dry hairs. Wash hair with #Bombar Coconut Shampoo. Repeat if necessary. Spread #Bombar Coconut Conditioner, lock by lock, right along the length of the hair to the ends.